The Center for Biogenic Natural Gas Research develops and commercializes technologies that enhance the production of renewable, cleanburning natural gas in coal seams and other fossil fuel reservoirs using indigenous microorganisms. The Center’s primary objective is to add value to Wyoming’s vast energy resources by keeping them viable in the energy economy of the future. Founded in 2007, the Center is one of several Centers of Excellence established with seed funding from the School of Energy Resources at the University of Wyoming. Researchers at the Center for Biogenic Natural Gas Research are currently involved in the development of several new and innovative technologies designed to bring economically depleted hydrocarbon reserves back into production and extend their productive life. These technologies have the potential to create a new energy paradigm by changing the way we look at fossil fuels. There are several approaches for enhancing the production of biogenic natural gas in coal seams. The more conventional approach uses nutrient amendments to stimulate microbial activity within the coal seams. 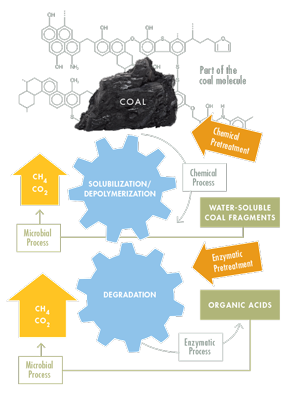 At the Center for Biogenic Natural Gas Research, we have focused primarily on using chemical and enzymatic treatments that depolymerize/solubilize a fraction of the coal, making it more bioavailable to the microorganisms living in the coal that produce methane. Another promising approach uses a supplemental food source such as locally grown perennial forage crops, like alfalfa, switch grass, or miscanthus, to supply monomers (simple sugars) for the methane-producing microorganisms that live within the coal seam. 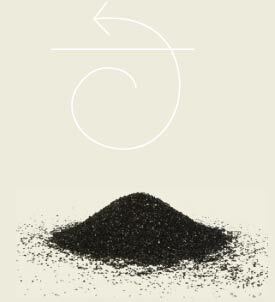 These simple sugars are delivered to the coal seam where they can be transformed into methane and recovered using the existing coal-bed methane infrastructure. Unlike cellulosic ethanol and other biofuel processes, which require capital-intensive production plants that are limited by the size of the fermentation reactor, our process utilizes vast coal seams and the microorganisms within to transform simple sugars into natural gas. 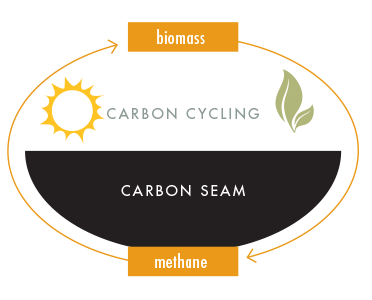 Because this approach uses biomass instead of coal as the carbon source, the biogeic natural gas produced by the process is carbon neutral. Addressing the transformation of biomass, coal, oil shale and other sources of energy into natural gas within biologically active reservoirs by understanding the reaction mechanisms and investigating methods to expedite the involved processes for biogenic natural gas production. Addressing feasibility through determining which methods or engineering approaches can achieve the highest gas generation rate, how much biogenic natural gas can be produced, how long the gas production will last, cost implications, etc. The Center for Biogenic Natural Gas Research is working toward the commercial-scale development of technologies that will enable producers to derive cleaner, renewable biofuel energy from Wyoming’s coal resources using naturally occurring processes.